Tromsø, a small town way up in the Arctic Circle, seems an unlikely spot for any kind of international cultural gathering but it is, in fact, the venue for Norway’s most attended cinematic event – the Tromsø International Film Festival. And this is where we found ourselves in January, almost exactly a year after our film, The Sun Behind the Clouds, screened at the Palm Springs International Film Festival and set us off on a roller coaster ride of festivals and screenings. It seemed an appropriately remote place to bring our journey to a close. Tromsø’s a beautiful little town, set on an island surrounded by fjords and mountains, snugly clad under a thick layer of ice and snow. A bluish crepuscule cast an enchanted light for the best part of three hours around midday before fading into darkness. The town boasts many “northernmost” accolades, including the world’s northernmost Burger King! Interestingly, it’s also the home of electronica duo, Röyksopp, whose 2001 album, Melody A.M., was a big favourite of ours. But Tromsø is most famous for its Northern Lights, a sight we hoped to catch while in town. Sadly, aurora borealis remained in hiding for the four days we were there. We expected the temperature to be well below freezing but in fact, after hitting -3°C the first day, it warmed up to just above zero and caused some concern among the festival organisers that their giant outdoor snow screen where some of the screenings were to be held might begin to melt. In the event, the snow screen held up. The festival screenings were divided between a number of cinemas spread around town, including a wonderful old theatre called Verdensteatret Kino, which was built in 1916. The festival was laid back in an efficient way, and our three screenings were well attended, including one sold out show. Many thanks to Chungdak Koren and her team from the Norwegian Tibet Committee, who were present during the screenings to publicise the situation in Tibet. It was nice to see that even a town as distant as Tromsø has a local Tibet support group. Meanwhile, in India, the Tibetan Youth Congress, who are distributing both the international and Tibetan language versions of the DVD in South Asia, launched the film in Sarnath during the Dalai Lama’s teachings. They had two packed screenings of more than a thousand people each. This was followed by two sold out screenings in Dharamsala. TYC reports brisk DVD sales with a fair number headed for Tibet. One of our goals in making this film was to do our best to make the film available in Tibet and China. To this end, we made a Tibetan version and also added options for Traditional and Simplified Chinese subtitles on the international version. We know from past experience that Tibet-related videos and CDs from India do end up in Tibet and China. A pirated version of our previous film, Dreaming Lhasa, was available in Beijing with home-made Chinese subtitles! Now it is time to move on to our next film. More on that in our next update, which will be posted on our revamped White Crane Films website (http://whitecranefilms.com). Thank you all for sharing this journey with us. We hope to have you on board for the next one! As a Tibetan filmmaker working in China, Pema Tseden has to tread a very fine line. Whether he continues to make films or not depends entirely on how the Chinese authorities appraise his work in terms of its perceived political loyalties. The uprising of 2008 has made it more difficult than ever for Tibetan artists, writers and filmmakers to operate, given the heightened focus of suspicion that they find themselves under. More than his Chinese colleagues – who are themselves under the constant threat of censorship and blacklisting – Pema Tseden has to be especially careful in his choice of subjects and his treatment of them. Like his inspiration, the Iranian filmmaker, Abbas Kiarostami, he has to juggle between the demands of an authoritarian government while remaining true to his vision. The recent arrest of Jafar Panahi is yet another reminder of the consequences that face artists who step out of line in countries like Iran and China. It is to Pema Tseden’s credit that he adroitly and beautifully navigates this treacherous path in his new film, The Search. The Search is in the mould of a classic road movie. On the surface, the tale it tells is deceptively simple. A Tibetan filmmaker, accompanied by a businessman, an assistant, and a driver, sets out in a four-wheel-drive across rural Amdo, searching for actors to play the key roles in his new film, which is based on the popular Tibetan opera, Drime Kunden. This much-loved parable tells the story of the Bodhisattva prince, Drime Kunden, who sacrifices everything he has, including his wife and children, and finally even his own eyes, in the service of others. A series of encounters along the way gently propels the film to its subdued and enigmatic climax. As with his first film, nothing much happens by way of drama. Static camerawork, long takes and predominantly long shots that distance the viewer from the characters are the hallmarks of the film. Pema Tseden’s approach is stylistically formalistic and challenging, and makes no concession to the audience. We are forced to engage with the film on its own terms but by the end, we are moved and left with a sense of longing and disquiet. As the group makes its way through dusty villages and towns in the Amdo highlands, a number of intriguing, seemingly unrelated stories emerges. A young woman’s voice is perfect for the role of Princess Mande Zangmo, Prince Drime Kunden’s wife, and the director is elated. But she agrees to act in the film only if he will take her to see her old boyfriend and singing partner who has left her and is now a teacher in a distant village. Renowned for both her voice and her beauty, we never see her face, which she keeps covered behind a scarf for the duration of the film. Another strand follows the story of a first love that ended in betrayal that the businessman narrates to the director. Unravelling in bits and pieces as they drive through the countryside, this account makes a deep impression on both the director and the young girl who listens avidly in the back of the car. Other meetings with potential actors take place in schools, monasteries, village homes and even a karaoke bar. The haunting melodies of the arias from Drime Kunden, snippets of which are sung by some of the amateur performers during their auditions, remind us of how moving and beautiful the opera is even as they counterpoint the fact that many of the people the director encounters are unaware of or have forgotten the songs. Interestingly, there is no visible Chinese presence in the entire film but we sense the changes that are taking place in terms of the dissolution of traditional culture in the face of the encroachment of the modern world. Along the way, the director begins to question his own faith in the spiritual purity of Prince Drime Kunden’s sacrifice even as he is drawn to the more mundane concerns of unrequited love, as highlighted by the businessman’s story and the girl’s determined search for her former lover. The film has an elegiac quality to it; a loving farewell to a fast-disappearing way of life tinged by a sense of apprehension at what is to come. Pema Tseden’s film is a powerful example of the voices that are evolving within Tibet in the fields of art, literature and music. The subtext here, in the absence of political freedom, is a forceful assertion of Tibetan identity, which itself becomes a political statement. 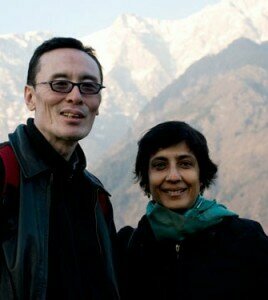 Pema Tseden lives in Beijing and makes his films in Tibet, whereas I live and work in exile. I have the freedom to explore subjects that he cannot dream of touching, but he has access to our homeland and is directly connected to the changes that are taking place there. And yet, despite these differences, we share a kinship that springs naturally from our shared history and concerns, and easily overcomes the false barriers that divide us. This fact is subtly emphasised in the soundtrack of The Search, which consists almost entirely of exile Tibetan singer, Techung’s traditional songs from Central Tibet. Under any circumstance, this would be an anomalous choice, both because Techung is an exile and because traditionally, Central Tibetan songs would not have been heard in Amdo. But in the new reality, where cultural cross-pollination, both within the traditional regions of Tibet, and between Tibet and the exile Tibetan world, is thriving, this seems to be an affirmation of the deep links that continue to bind all Tibetans. Back in Delhi after two hectic months of travelling with the film in the US and Europe. It was an exciting trip: great screenings, positive audience feedback, and the opportunity along the way to catch up with old friends and make many new ones. And through it all, we had many discussions on the Tibet issue and heard many different perspectives and opinions that were both challenging and illuminating. One thing became clear to us: Tibetans everywhere are impatiently waiting for some clear direction on the future of the movement. Although this sense of anticipation expressed itself most pressingly in the continuing debate over whether to continue with the Middle Way Approach or to go with independence, it became evident that this was only the beginning of a much larger and more complex process, one that requires the active and meaningful participation of all Tibetans. Hopefully, our film has served, and will continue to serve, as a platform to propel this discussion into a more public and engaged forum. After the Film Forum screenings in New York, our first stop was Seattle where the film had a one-week engagement at SIFF Cinema, the theatre run by the Seattle International Film Festival. We stayed with our old friends Jim Simon and his wife Lori Fujimoto who we have known from our student days in the Bay Area. Jim, who was with me at the Graduate School of Journalism at UC Berkeley, has followed his journalistic passion and is now the assistant managing editor of the Seattle Times. Two other friends from our Berkeley days, Steve Evans and Monica Fletcher came over from Port Townsend, so it was quite a reunion. This happy gathering was further enlivened by the arrival of our good friends, Tsering Shakya and his wife Lhamo, who drove down from Vancouver. From Seattle we flew to Minneapolis to attend the Minneapolis-St Paul International Film Festival. This was our first visit to the city and we were excited to be here, having heard so much about its burgeoning Tibetan population, estimated to be around 3000. We managed to pay a quick visit to the local community centre and were impressed by the efforts of the Tibetans here to find ways of keeping our cultural identity alive. We had a packed screening followed by a lively discussion at a local bar with a number of Tibetan activists and supporters. Then it was on to Los Angeles. The Indian Film Festival of LA is the biggest such festival in the US and is efficiently organised with a number of high profile events. The screening at the impressive Hollywood Arclight cinema complex was well attended and co-presented by the Tibetan Association of Southern California and the LA Friends of Tibet. We found out after we left the festival that the film had won the Audience Award! Next stop was the Washington DC International Film Festival, where we caught up with many old friends from our Dharamsala days. Our thanks goes to the International Campaign for Tibet who helped us with the outreach, not only here but throughout our US run. Our last destination was Boston, where the film had a one-week run at the beautiful old Coolidge Corner Theater. Once again, we met up with several friends from Dharamsala. Nearly all the people we knew in Dharamsala in the 90s and early noughties have ended up in the US! Now, it’s a short moment of rest and respite before we launch into the next phase of our journey with the film. The Sun Behind the Clouds opens in the Bay Area on June 18 and then moves on to LA, Santa Fe, Denver and Boulder, with other venues to be added. Thank you to all the friends, organisations, supporters and well-wishers who came out to promote and support our film. We look forward to continuing this adventure with you! Spring came to New York with a vengeance. One day it was freezing cold, overcast and miserable, and the next everyone was out in T shirts and shorts! Suddenly, the streets were ablaze with cherry blossoms. Even as we marvelled at the incongruous beauty of flowering trees amidst the concrete canyons of Manhattan, the cherry blossoms began to disintegrate and their fragile petals fell on the sidewalks like snowflakes. The hanami spectacle was over even as it had begun, and one understood why the Japanese have such a special fondness for this most ephemeral of seasons, an annual lesson on beauty and impermanence. Meanwhile, at the Film Forum, our outreach efforts began to pay off. The first weekend’s gross was the second highest for a single screen release in the US! This doesn’t mean much in financial terms but it’s a huge boost for the film and a good start to what will hopefully be a wider theatrical release. We were encouraged to see so many Tibetans – many of them young – showing up for the screenings, and even more touched by their response to the film. The film continued its strong run in its second week, and should end with respectable figures when it closes. Our thanks to the many organisations that helped us with our outreach campaign: The Office of Tibet, Tibet Fund, Tibet House, International Campaign for Tibet, Tibetan Youth Congress (NY and NJ), Tibetan Association of NY and NJ, Human Rights Watch and Human Rights in China; and many, many individuals who volunteered their time and support. A special thanks to Phurbu Dorjee la who was tireless in his efforts to promote awareness of the screenings among the Tibetan community and continuously inventive in finding ways of doing this. Lastly, without the active support and collaboration of Students for a Free Tibet, we would never have made it so far. A big thank you to the SFT team, and in particular, to Tendolkar and Yvonne Shen for working so hard to push the film. As our New York run comes to an end, we received good news from France that the film has just won the Prix du Public (Audience Award) at the Films de Femmes festival in Creteil. Our friends, Diana Kimoto, Tenam and Patrick Mahoney, were there to support the film and we thank them for their efforts. The New York weather finally cleared up after a brief return to winter-like conditions, and Wednesday was fortunately a dry day; the sun, you could say, appeared from behind the clouds! The 8 pm screening was packed, a full house. There were many friends, family members and acquaintances in the audience. The foyer of the Film Forum was temporarily turned into a Tibetan activist space as members of Students for a Free Tibet set up a table and handed out literature and petitioned for jailed filmmaker, Dhondup Wangchen. Mike Maggiore, the genial programmer and publicist of Film Forum who, along with the rest of the staff, has been incredibly supportive of both the film and the Tibet cause, introduced us and moderated the q&a afterwards. The audience response was genuinely positive and we were touched that so many people came up to us later to tell us how the film had moved them and provoked them into thinking differently about the Tibet situation. We then repaired to the nearby Bubble Lounge where Yodon Thonden, long-term Tibet activist and supporter, sponsored an after-screening party. Our thanks also to Emmanuelle Chiche, managing director of the Bubble Lounge for hosting the party. Everyone had a great time and it was a fitting end to a long-anticipated event, fraught with expectation. The successful opening night and an equally good second day bode well for the rest of the run, and have been all the more encouraging because only the day before, the long-awaited New York Times review had dropped on us like a bombshell. It was a dismissive review of the most superficial kind and made us wonder if the reviewer had actually focused on the film, or had simply brought to bear all his prejudices about Tibet and the Dalai Lama onto his critique. This was all the more distressing because as every filmmaker knows, the New York Times review carries a huge clout and can make or break a film. Fortunately, none of the other reviews were even close to being as negative; in fact, the majority were solidly positive (for a list, please go to Press). This brought home to us once again how fragile and exposed we filmmakers (and artists of all ilk) are when it comes to the whims and vagaries of the press and market forces, and how years of hard work can be brought down in an instant by one critic’s flippant comments. Still, as the Film Forum folks told us, some movies are review-proof and hopefully, this is one of them! On other news, after much deliberation and discussion, we have decided to pursue a hybrid model for our American distribution. Balcony Releasing will secure theatrical engagements for the film across America. Zeitgeist Films will handle the non-theatrical DVD sales and semi-theatrical bookings. We’re thrilled to be working with these two very reputable and respected companies. London was a whirlwind visit. We had a live discussion with Geeta Guru Murthy on BBC World TV’s Impact Asia programme. This was both nerve-racking and strangely comfortable. We’ve watched so many BBC World news broadcasts, watched Geeta herself read the news so many times, and seen so many guests sit around that same table that when we were finally ushered into the studio and made to take our places, we felt like actors in a familiar play. We also did a long discussion on the BBC World Service’s arts and culture programme, The Strand. The guest in the studio before us was none other than David Byrne! As long-term Talking Heads fans (I saw my first Heads concert in Hollywood in 1981, and Ritu and I watched them again in Berkeley in 1983), this was an unexpected honour to come face to face with him! Ritu introduced us and told him that were his fans and got him to sign an autograph for our son Mila, who is also a Heads fan. Ritu also told him about our film’s screening at the Film Forum and he said he would come! The radio discussion was in-depth and touched upon many areas that we had raised in the film. The show will go out this week and we will post it on the film’s Facebook site. On Friday evening, we had the Closing Night screening of the Human Rights Watch Film Festival at the Ritzy in Brixton. This was familiar stamping grounds for us from the days when we lived in London. We’ve spent many a long night in these parts and still have close friends who live here, a number of who turned out to support us. It was a fantastic screening at the Ritzy’s restored old cinema. The hall was packed, and the high def projection was excellent. At the panel discussion after the screening, Isabel Hilton moderated with insight and flair. Dr Kerry Brown from Chatham House, His Holiness’s representative Thubten Samdup, Ritu and I spoke about various aspects of the difficult situation Tibet faces at the moment. Sadly, because of time constraints, the discussion was cut short and we couldn’t take any questions from the audience. But at the reception afterwards at the Ritzy’s bar, we did manage to speak to some of the people in the audience. A young woman from Lithuania told me that the Tibet situation reminded her of her country’s recent history and that the important thing was not to lose hope. Another woman from the Czech Republic told me that she had seen the film at the One World Festival in Prague and had come to see it again to show her solidarity. It’s interesting that the people who seem to really understand what Tibet is going through are people from the former communist states of Eastern Europe. Our thanks goes to John Biaggi of the Human Rights Watch Film Festival and his excellent team for supporting our film and highlighting it at the festival. On Saturday, the Tibet Society, Students for a Free Tibet (UK) and the Tibetan Community of Great Britain organised a screening at the Prince Charles Cinema in Leicester Square. We had a great turnout, with many Tibetans in attendance. The response of the audience was really moving. We were really encouraged by the fact that so many young Tibetans told us afterwards that they thought the film really expressed what they were feeling. But more than anything, the response of a young Tibetan woman from Lhasa who was deeply moved by the film, meant everything to us. Now it’s back to New York and all focus is on the Film Forum opening! We left Prague yesterday. The previous evening was the Closing Night ceremony of the One World Human Rights Documentary Film Festival and a most memorable one for us. Not only did we receive the Vaclav Havel Award from President Havel himself, we won another award, the Rudolf Vrba Award, which is given to the best film in the Right to Know category. The jury for this award is deliberately made up not of filmmakers but of individuals working in the field of human rights, and this year’s jury included Burmese activist, Ko Maung, and Chinese human rights lawyer and Charter ‘08 signatory, Li Xiongbing. In their statement, the jury said: “This year the Rudolf Vrba Jury Award goes to “The Sun behind the Clouds”, a film by Ritu Sarin and Tenzing Sonam about the Tibetans’ human rights struggle. It portrays courage, passion and wisdom, and it inspires, challenges, and asks questions. What do freedom, independence, and autonomy mean in today’s world? What do we expect from those who have influence over people’s thoughts and feelings? And finally, should we, when fighting for human rights, make decisions with our hearts or with our minds? President Havel is a much loved and respected figure in the Czech Republic. People still address him as Mr President even though it’s been years since he left office. He is a much smaller man than we expected and his recent illness has left him looking frail. But there is a naughty sparkle in his eyes and you can still feel his drive and energy. At the award ceremony, he read out a brief statement explaining why he had selected our film for the special award. The way it works is that a jury pre-selects a small number of films that it believes will be of interest to Havel, and then he watches the short list and makes the final decision. His main reason for selecting our film was that it showed the complexity of the Tibet situation in a human way and for the first time made him understand the heart of the Tibetan people. We will post the English translation of his remarks and those of the Right to Know jury as soon as we get them from the festival. After the ceremony, there was a party at the bar of the Lucerna Cinema, a beautiful old theatre built by President Havel’s grandfather. The bar was packed with people and – in a sight that is increasingly rare these days – full of smoke as the Czechs puffed away with abandon! Havel sat at a corner table and we had the honour of sitting with him. Our executive producer, Francesca von Habsburg, had joined us for the award ceremony and was as excited as us to meet him. One of the questions I asked him was what he thought about the division between His Holiness’ Middle Way Approach and those calling for independence. His response was that he felt it was important for His Holiness to have his way but equally important for the people to follow their own path. He told us that his hope for instituting the award in his name was that it would bring greater awareness to the causes the films represented. Earlier, we had met Li Xiongbing. He told us that he felt it was really important for Chinese people to see our film. For him, it opened his eyes to the fact that the Chinese government was lying about His Holiness’ sincerity in not wanting independence. It was brave of Li Xiongbing to back our film for the Right to Know Award considering he has to go back to Beijing, and an encouraging sign that there are people in China who are willing to listen to our point of view when it comes to Tibet. The One World Film Festival is a great example of how meaningful films that tackle a host of pressing global issues can be presented in a way that reaches out to all kinds of people. The audiences in Prague were mostly young and the screenings were all packed. This is an encouraging sign that documentary films about human rights issues are shedding their fuddy-duddy image of being only for activists or well-meaning supporters of causes, and have the potential to appeal to a more general audience. Welcome to our blog, which we will attempt to update regularly as we go on this journey with our film. This is our first blog post and we are writing it in Prague where we are attending the One World Human Rights Documentary Film Festival. Of course, the great news here is that our film has won the Vaclav Havel Award for its contribution to the protection of human rights. We were told by the festival organisers that Havel watches a shortlist of films and then chooses the final film himself. This award means a lot, not only to us but to the larger Tibetan cause. Havel is a great symbol of human rights and democracy and his support of the Tibet issue and friendship with the Dalai Lama is well-known. Hopefully, the award will send a message to Tibetans in Tibet that there is support for our cause and that their sacrifice has not been in vain. We will received the award from President Havel at the closing night ceremony on Thursday, the 18th. Prague is as beautiful as everyone says it is but freezing cold! The festival, though, is warm and friendly, and we’ve already met a lot of filmmakers. We had a full house at our screening last evening and an intense q&a. What’s interesting about the audiences here is that they are very young. There’s a feeling of youthful energy and concern for larger issues that is very encouraging. This morning, Tenzing did a live conversation on Czech TV with Igor Blažević, the founder of One World. Igor is a Serb who has lived in Prague for many years and was instrumental in setting up the NGO, People in Need of which One World is an offshoot. He is a dynamic and passionate man and the conversation was thoughtful and focused. They spoke about possible scenarios for a future when His Holiness the Dalai Lama is no longer there to lead the Tibetan people and also what could be done to prevent the Tibetan movement from disintegrating. Meanwhile, Tenzin Tsundue, who is helping us organise community screenings in India and Nepal, has been on the road and has had screenings in conjunction with Friends of Tibet, in Bangalore, Mumbai and Ahmedabad.